Mica pigments are some of the most beautiful colorants in the cosmetic industry. Learning how to formulate with mineral makeup powderes will enable you to expand your line to include a greater variety of shades. 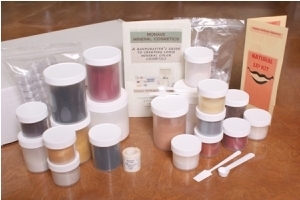 The color cosmetics kits are fun and rewarding, and make fabulous gifts for teenagers and crafters. 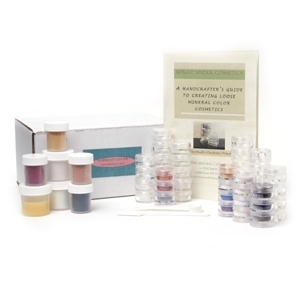 The kits teach handcrafters how to blend mica-based shimmer and pearlescent pigments together to create a cosmetic palette that includes pastels, earth tones, smoky liners, and more. The finished mineral product is a versatile mineral makeup powder that can be used as an eyeshadow, a liquid liner, a blush, and a colorant for lipgloss, nail polish, and body-care products. The formulas are presented in quantity ratios, and exclude micas that are coated with carmine, or artificial dyes. 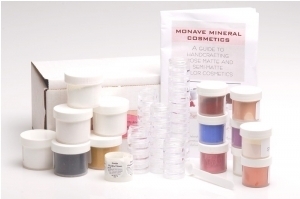 The manual is thorough and guides you through a step-by-step process of formulating your own beautiful mineral makeup. Kit for professional makeup artists.